Sorry I’ve been MIA around here. Mr HP and I adopted a dog at the beginning of the year and my free time has since evaporated. Now that we’re in a routine I’m hoping to be able to write more. Plus, winter is depressing and demotivating. So this is just a quick post to try to get back into the swing of things. Kantine’s success led to the creation of a second location, Das Lokal, which sources game from the forests surrounding Berlin. Wild game is about as far from industrial livestock as you can get! Kantine is not to be confused with Kantine Kohlmann, a …”trendy bar and restaurant [that] uses local, sustainable ingredients to make delicious modern twists on German classics” per this article. For a splurge, try the “quite near” (as opposed to the “far away”) menu, which is based on local ingredients, at Reinstoff. Another special occasion destination is Pauly Saal, which sources local ingredients, including from its own garden. And finally, it doesn’t get much more local than the Café and Restaurant in Prinzessinnengarten, which sources ingredients from Prinzessinnengarten itself. We serve local and regional organic food and drinks if possible and support small-scale organic producers in and around Berlin. All the revenues from the bar and the kitchen contribute directly to the non-profit learning activities in Prinzessinnengarten. Prinzessinnengarten is an urban farm raising organic produce, and neighborhood education center where the community can learn about sustainable living. The garden, built on an abandoned city plot, is run by a non-profit and tended by volunteers, and hosts workshops and other educational opportunities. It reminds me of a similar effort in Perth that I was lucky enough to visit last year. Here is a map showing the locations discussed in this post. If you visit any of them, or if you know of others that should be included, let me know in the comments! Guest post from the swashbuckling Tiny Twosome. Thanks, Tiny Twosome! Last month, the Tiny Twosome (formerly known as Butter Boy and Butter Babe) attended the Sustain Floyd Tiny House Tour. This fun self-guided driving tour of six private tiny homes in and around Floyd, VA, gave us a peek into the homes, and lives, of a few folks who have made the choice to scale back on their material possessions and expand their time and resources for other things. We left Charlottesville Friday after work and hit the road toward Floyd, stopping in Lexington for a little dinner before finally reaching our destination: the Bent Mountain Lodge Bed and Breakfast. Even before the Tiny Tour, this place seemed expansive. We had a good night, though somewhat interrupted by a sound outside that made us think of a barking seal, and after a minimalist breakfast the next morning – slightly supplemented by food from the “family” refrigerator, before Butter Boy noticed the sign on the other fridge that read “Guest Refrigerator,” we headed off bright and early for the first house on our list. The 316 square foot house, built by Christy and Ricardo, powered by a solar system installed by Ricardo, was our first – and favorite – of the houses. The couple spent a year building their house – living in a tent for the first six months. Ricardo said that ten months out of the year they are able to feed power back into the grid and have the electric company send THEM a check. The couple lives mortgage-free, paying for projects and upgrades as they go, without going into debt. This cute two-story house sits on a on a permanent foundation. Some of our favorite features were the “big” wrap-around porch, cozy feel, and red metal roof. Inside, it was small but very livable for two. Our next stop was the Riverstone Organic Farm to see the tiny cabin where a farm worker (Kat) lives for the season. Although it is insulated and has electricity, this cabin has no indoor plumbing and is heated by a small woodstove. The little cabin has a sitting area, a curtained-off bedroom area, and a loft, and is decorated with Kat’s found treasures from around the farm and beyond. Kat said she does her cooking and washing-up at the facilities in the nearby barn / farm store. Also on the property was this yurt they purchased for use as a guesthouse and special events. We liked the stump steps up to the platform. Amazingly, Hari and Karl’s family of four has lived in this tiny house for the past four years. They constructed the 168 square foot house themselves on a mobile home frame, and have been living there mortgage-free while constructing a larger home on the adjoining lot. This tiny home has a sleeping loft at either end, and the downstairs contains a living area, kitchen, and bathroom. Their chickens enjoy a well-crafted home of their own. The extensive chicken compound looked like just the place to raise happy, well-adjusted chickens. I’m sure “factory farm” isn’t even in their vocabulary. We drove into town and had a nice lunch break at the Floyd Country Store, where Butter Boy enjoyed chicken pot pie and tomato soup and Butter Babe had a tasty quiche and white bean and kale soup. We spotted a few of the other Tiny Tourists who apparently had the same idea. Next stop was Jim’s 120 square foot self-built home – which was also constructed on a mobile home trailer. Jim, however, used only a small portion of the frame’s length (about 8 feet) for his home and dedicated the rest to an extensive deck and attached shed. It was by far the Tiniest of the Tiny homes we saw. With five of us standing inside, there wasn’t room for much more. The small home of Morgan and Amado has a bedroom area to the right of the front door, a sitting area straight ahead, and bathroom and kitchen off to the left. There is a storage loft over the kitchen and bathroom. The very open floor plan felt roomy for such a modest-sized home. After the tour we had to stop by the nearby Chateau Morrisette to taste some wine before dinner. Butter Boy abstained from the wine tasting – as he was driving. Butter Babe, however, was not planning to do any driving that day. 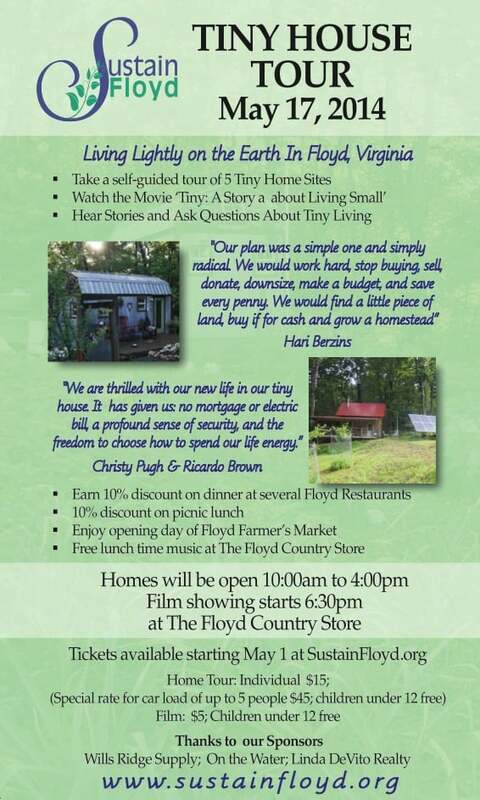 The final activity of the Tiny Tour was the showing of the movie “Tiny: A Story About Living Small” at the Floyd Country Store. The film followed a young man as he took longer than he anticipated to build his own tiny house – with help from his very patient girlfriend. A question and answer session followed with a panel of tiny homeowners (the homes, not the owners). More than a tiny bit tired, we returned to the Bent Mountain Lodge – which felt larger than the night before – for one more night before heading home with lots of ideas and things to think about.